We have around 500 pounds of garlic in the barn, and I'm quite sure any Count Dracula roaming the island by night is going to give us wide berth. This week on the farm, we've hit upwards of 90 degrees, but last week, it was dripping cold, wet rain. Oh, Pacific Northwest and your multiple meteorological personalities! 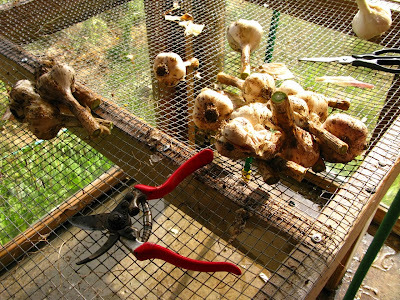 In some climes, folks leave their garlic bulbs in the ground to dry out, but the wet weather meant that we had to get those puppies out ASAP or face the wrath of the gods of mold and mildew. 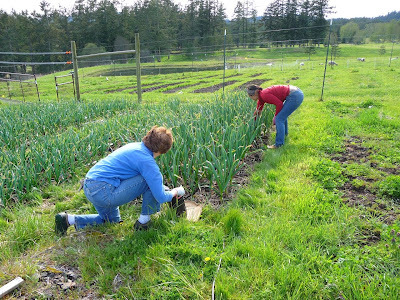 So over a couple of hours, broken up by spits and spurts of rain, Susan, Lucy, Colin and I harvested the garlic from 4 beds, about 600 square feet in all. The cloves had been planted on October 15th of last year into 4 inches of our own farm compost where it germinated and grew and then overwintered under a layer of straw mulch. 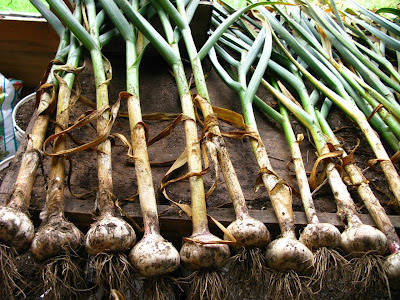 Something magical happened between then and July because the plants were tall and strong and the white tops of the bulbs peeking up from the wet soil looked more like good-sized onions than garlic. We carefully loosened the soil around the bulbs with a broadfork inserted 3-4 inches away, so as to keep from piercing the bulbs. Then we pulled. And pulled. And pulled. And pulled. 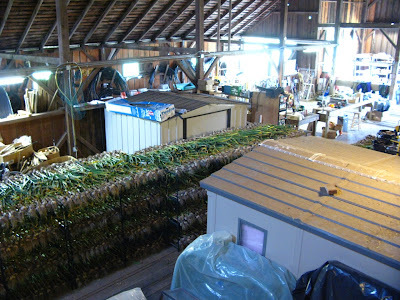 Until all 1500 or so bulbs were free from the soil and safely carted off to racks in the barn to dry. Me and Susan installing t-tape in the garlic back in April or May when the garlic was still pretty small and hadn't even started to produce curly, crunchy scapes. Eventually, the plants grew to at least twice this height, and started to turn brown and crispy along the edges. What didn't fit on racks ended up stacked wherever there was a flat surface: on the floor on top of empty feed bags and at the potting stations. 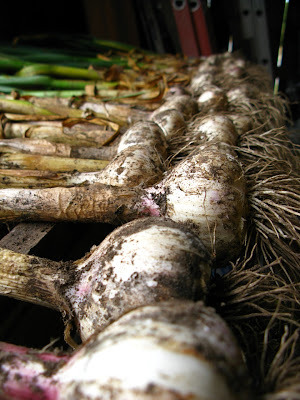 Most of the garlic was "Music" hard-neck garlic, but some was another hard-neck variety with beautiful purple veins on the papery skins and climbing up through the stems. 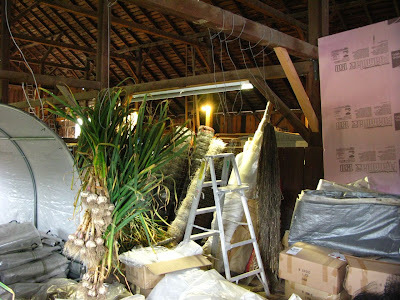 The next day, I tied and hung those extra bulbs up in the back of the barn, 10 bulbs to a bunch, four bunches to a hook. The s-hooks were made of 9-gauge wire, skillfully looped over a lowish beam so that they could be shimmied left or right along the beam to make room for the rest. Susan and I weighed some bulbs and found that they ended up somewhere around 3-to-a-pound. Big and bulging, with something like 5 or 6 kumquat-sized cloves to a bulb. 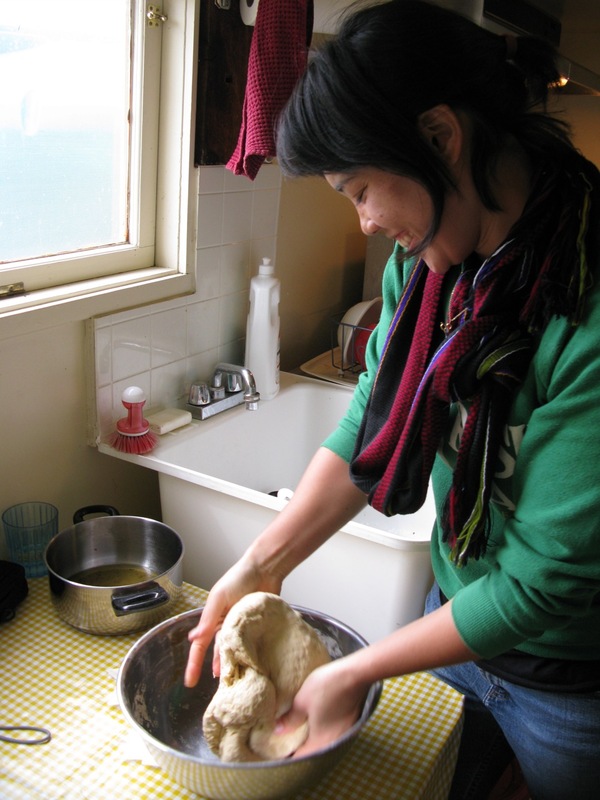 We all took some back to our kitchens (Lucy held no punches, and went straight for double green garlic soup) and some got all clean and dolled up to sell in the farm store. Just wonderful! We are planning to get some in the ground this fall, with an eye to eventual small producer amounts. I simply love your blog! Very well done. Love the writing the pictures and the recipes. 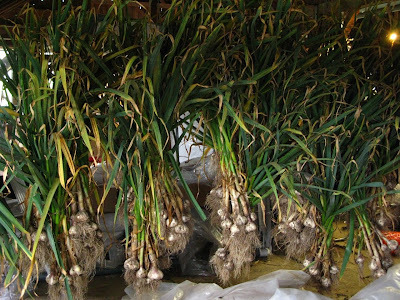 We just harvested our modest garlic patch and got about 50 pounds of organic garlic. Very excited. We are in the pacfic NW on the North Oregon Coast. 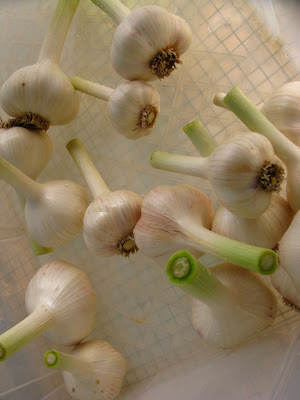 We are a little worried about drying the garlic with the stem and roots on in our damp climate. What do you think? Are you going to sell your garlic?